SNOW: Due to altitude snow conditions are very reliable. 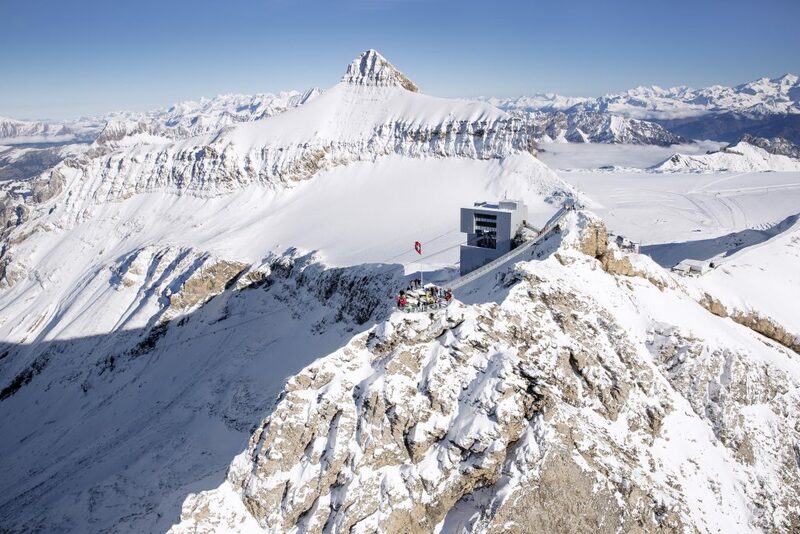 AIRPORT: Nearest international airport is Geneva -1:50 hours to Gstaad / 1:30 hours to Glacier 3000. The Valley and surrounding areas of Gstaad are classically beautiful. Legend has it that God took a short rest whilst creating the world. The imprint of his hand shaped the surrounding Saanenland region. His five fingers formed the valleys, with Gstaad sitting in the centre. The valley still seems to support a notable amount of traditional industry such as the 200 farms housing 7000 cows in total, but tourism also plays a big part of Gstaad’s history. Originally International schools attracted an affluent audience from around the globe which eventually helped the tourist industry grow. 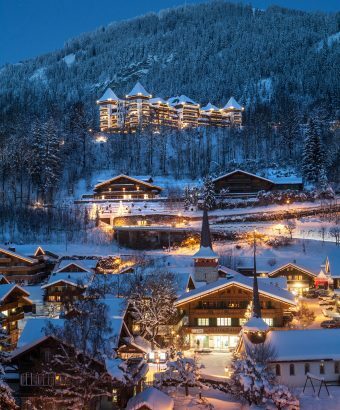 Gstaad has been popular with international celebs holidaying and settling down for quite some time; such as British royals, Richard Burton, Liz Taylor, Brigitte Bardot and Roger Moore. 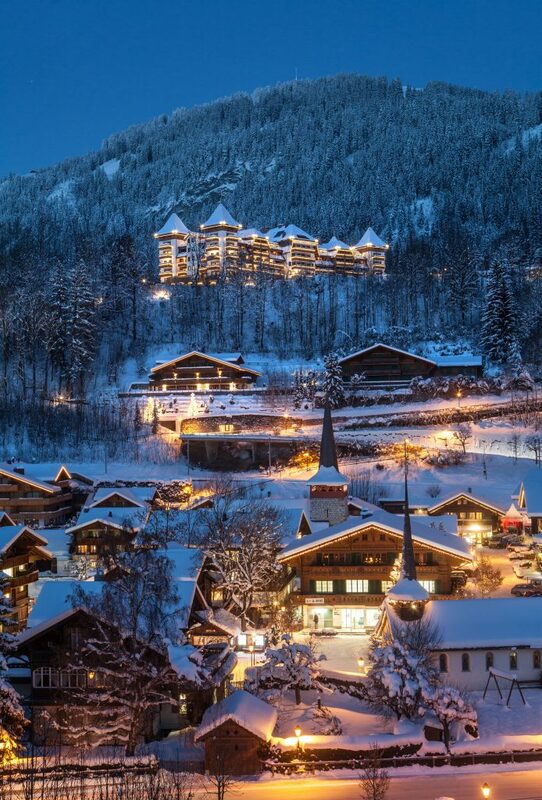 Local resident Julie Andrews once said: “Gstaad is the last paradise in a crazy world”. The town has a fantastic selection of modern high end boutiques such as Louis Vuitton and Ralph Lauren, and boasts 18 gourmet restaurants all whilst retaining its beautiful Alpine charm. When it comes to Luxury hotels one is spoilt for choice, with the Alpina Gstaad being one of the best. 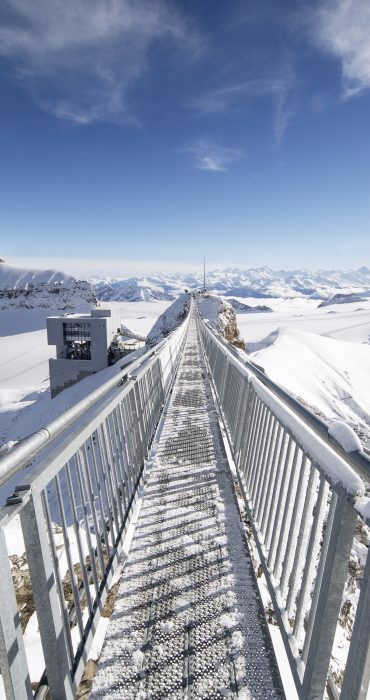 We visited in early December 2015, which sadly was a slow start for the Alps. Temperatures were still high, it was still autumn in the valley and the snow had seemed to have missed the memo that winter had arrived! However, this did not matter because we were visiting Glacier 3000 in Gstaad. 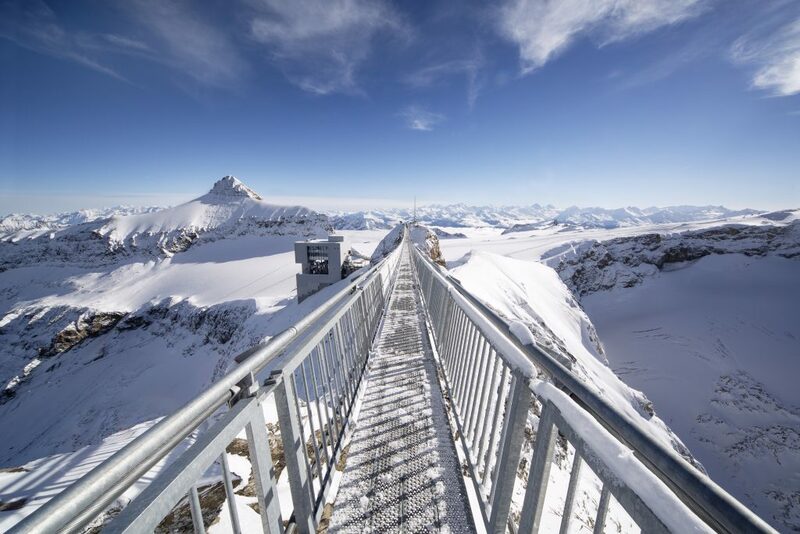 It is only 20 minutes drive from Gstaad and has a huge free parking area at the base ‘Col Du Pillon’ at 1546m. From here one can take the slick cable car up to Cabane and then another cable car up to Scex Rouge at 2971m with breathtaking views and steep cliffs the whole way. On this occasion we shared the car with a gorgeous dog sled team who were heading up to take advantage of the perfect terrain. Arriving at the top feels like one has entered the outer stratosphere of the earth. The snow conditions are fantastic most of the time due to the altitude, which results in some great carving. 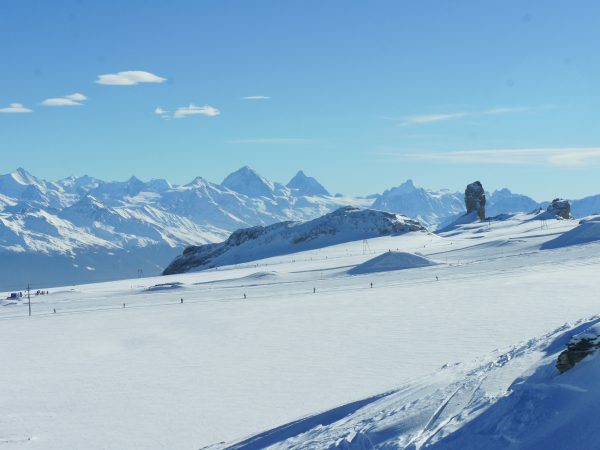 The conditions also allow for some great beginner powder lessons especially ‘skiers-right’ of piste 105, but just be aware that you are on a glacier which does have crevasses. Its really worth visiting the Refuge de l’Espace over at Quille du Diable. 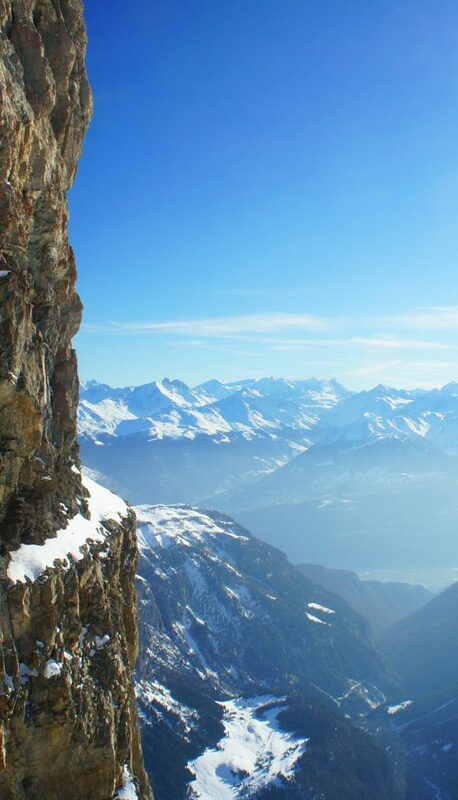 It clings to the cliff and presents heavenly panoramas towards the south of Switzerland and onwards to Italy. 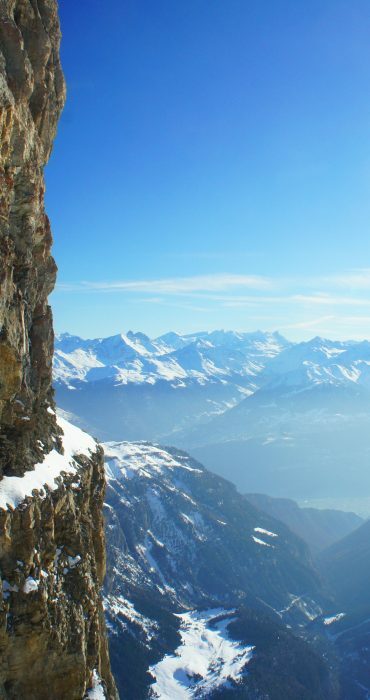 It is a great place to watch the alpine birds hunting and gliding on the thermals rising up the cliff. Just be aware that the first 100 metres of the Blue ski slope 103 from the top, is more red than blue, so it can be scary for beginners. Once past this the Alpine playground opens up though. 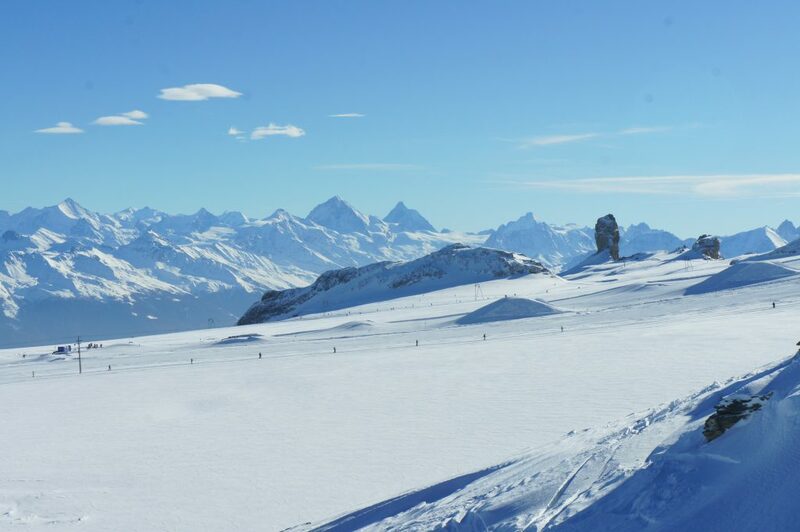 Glacier 3000 has an array of gentle glacial blues and is a great centre for carving due to the amazing snow conditions at this height. There is not a lot of intermediate skiing, but despite this people of all experiences should find the area a lot of fun. 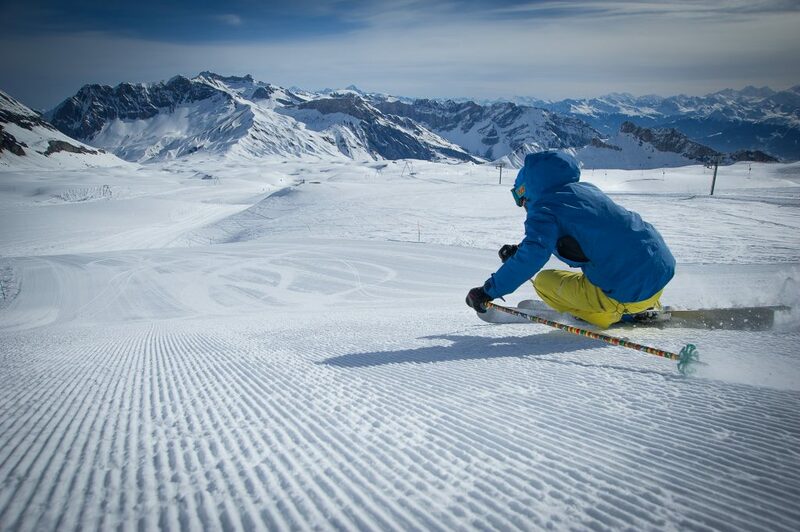 The Olden run is a notable black 7km piste covering a 1106m vertical descent, so make sure you bring your ski legs. Due to its north facing aspect and the looming mountains the piste sits in the shadow all day so the conditions were cold, steep and bulletproof snow. There are many steep sections and several bottlenecks but this all makes for an exhilarating adventure. I should add that this should be reserved for the advanced skier. The park is open from October to January. It usually has 4 beginners kickers and boxes and a selection of 4 expert kickers and 4 rails. 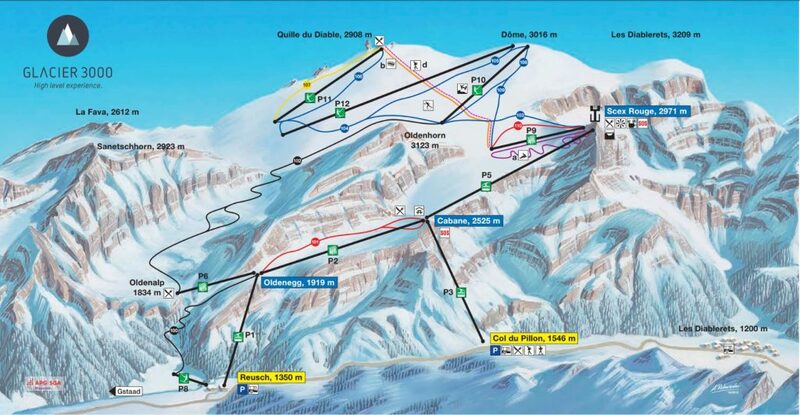 Glacier 3000 1350 – 3000m / Vertical Drop 1650mTotal 25km of piste – 7 Blue (9.7km) / 2 Red (3.2km) / 2 Black (12.1km) / 1 terrain park. Lift system 10 total – Cable-3 / Chair lifts-3 / Drag lifts-4.5 mountain restaurants/bars. If you are staying in Gstaad, then we can highly recommend the luxury 5-star hotel Alpina Gstaad.